A coating of hairy electronic skin could soon help robots feel the slightest breath of air or detect the faint vibrations of a beating heart. Kahp-Yang Suh and colleagues at Seoul National University in South Korea wove together thousands of individual polymer nanohairs to make a flexible touch sensor that is more sensitive than human skin. The idea for the device came from the interlocking of cells in human hair and organs.These organically woven-together cells translate inputs of force into electrical signals that are then interpreted by the brain. 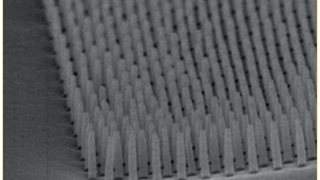 Similar to their organic counterparts, the 50-nanometre-wide hairs of Suh's device twist and bend against each other when an external force like a beating heart or a soft touch is applied. The contact between the hairs generates an electrical current which the sensor identifies as specific changes in pressure, shear or torsion. These results are displayed on a computer monitor in real time.